I firmly believe that there are both a right way and a wrong way to go about the process of inviting, selecting, appointing and ultimately working with banks that lead an initial public offering (IPO). Unfortunately, many corporates fail to understand how investment banks function, what makes them and their executives tick, and to what extent they could make their lives so much easier by being even slightly ever more directive in their dealings with financial institutions, saving themselves much pain and misery in their run up to listing on a stock exchange. I firmly believe that there are both a right way and a wrong way to go about the process of inviting, selecting, appointing and ultimately working with banks that lead an initial public offering (IPO). Unfortunately, many corporates fail to understand how investment banks function, what makes them and their executives tick, and to what extent they could make their lives so much easier by being even slightly ever more directive in their dealings with financial institutions, saving themselves much pain and misery in their run up to listing on a stock exchange. As an equity capital markets investment banker, I spent a lot of time pitching for new mandates. Among these were many IPOs, either large privatizations or private sector flotations of all sizes on behalf of families, or institutional or private equity shareholders. Sometimes, these pitches were well rehearsed and followed a strict protocol, down to a very precise script for each of the members of the presenting team and, in some cases, featuring what were (back in those days) innovative devices, such as the playing of video segments figuring colleagues who could not – for compliance reasons or otherwise – be present on that day, and who chimed in to express their enthusiasm for the proposed offering. On other occasions, these were very much last minute affairs as my employer and I desperately tried to catch an ambulance that had eluded us, and to elbow our way into a deal for which other houses had already been engaged. I also had the opportunity, under various circumstances, to sit on the other side of the table, and to interview investment banks vying to be hired for an IPO, which I have always found fascinating. The variety of the presenting styles and arguments often made it plain which firms knew what they were talking about (or at least it came across that way) and which ones seemingly had no clue about the ins and outs of the transaction that was up for grabs. I saw executives within a single firm arguing among each other when trying to make a point. I also saw bankers introducing themselves to each other prior to entering the boardroom where the presentation was being held, a clear indication that no rehearsal had been conducted in that particular instance. I had to listen to bankers apologizing they that probably were widely off the mark in terms of the valuation for the company, a sure sign of the lack of robustness of their arguments, while others painfully read their PowerPoint slides line-by-line, oblivious to the fact that the whole audience had realized they were probably looking at these for the very first time. I similarly recall an episode when I was inadvertently copied on an email sent by the managing director of a firm to one of his juniors, one or two days prior to the bank’s interview by the company, frantically asking whether the pitch book was ready for him to look at, leaving me in no doubt as to whose thoughts and input we were about to be subjected to. And in a blatant case of pitch material recycling, an investment bank even included one of the selling shareholders in a list of target investors for the IPO. You get the picture. Conversely, some firms came across as very assertive in their recommendations and relaxed in their presenting style. They were able to convey so much more than their competitors, within the same imparted 60 minutes. For example, they could refer to many relevant examples of past transactions they had been involved in to illustrate a particular issue, thereby conveying a vast experience. Their line up of attendees were also seamlessly able to interact with each other, giving an impression of harmonious team work, not forgetting to add the occasional dose of humor, always welcome (and a relief) when one has to sit through a dozen or so ensuing presentations on the same subject. And I am always astonished at the ability of senior investment bankers who have failed to give signs of life for sometimes years to suddenly become your best friend, leaving innumerable voicemail messages on your mobile as soon as a request for proposal – invariably known within the investment banking industry as an RFP – hits their email in-boxes! However, engaging brokers is not all about how well they come across. As an investment banker, I was always amazed at how little negotiating power issuers and their shareholders realized they could muster with investment banks. In many cases the bank would have accepted the mandate on lower fees, had the company bothered to ask, or even agreed to absorb a high amount of transaction or out-of-pocket expenses if that had also been requested. There is always a tipping point in the relationship between a company and its IPO banks where the negotiating advantage shifts, and that is when the banks become formally mandated. At that point, they will gang up to protect their own interests, making it so much more difficult for the issuer to impose its views. On the other hand, prior to that particular stage, there is so much that can actually be imposed (within reason) on prospective lead banks, yet few IPO candidates, except perhaps those working with advisers or consultants, take this opportunity to make the process more efficient and quicker. Indeed, taking full control of the process at the pitching stage simply results in a speedier IPO, and also in one where considerable cost savings can be achieved, not to mention a much healthier handle on potential liabilities, as a result of pro-active involvement in the drafting of the various contracts to be entered into with the banks and other parties. 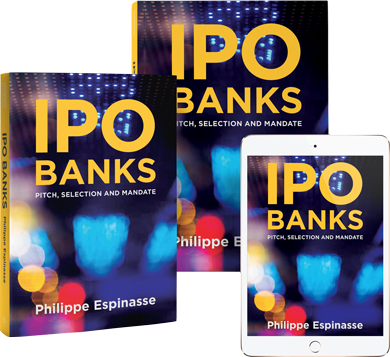 In this practical guide, I have de-constructed the engagement of IPO lead banks into several key building blocks, explaining at each stage how best to manage the process and the various participants. I have used many real-life examples based on my experiences as a former investment banker, as well as on my ongoing dialogue with industry participants and members of the media. I have included sample documents (invitation email, score sheets, request for proposal questionnaire, IPO terms sheet, clauses for mandate letters or international placing agreements and so on), all actually used on real flotations, as well as checklists for issues such as the allocation of work among multiple, senior investment banks or the various parties to be appointed alongside the bookrunners in an IPO. Everything that is included in this book is based on actual transactions – nothing has been invented. 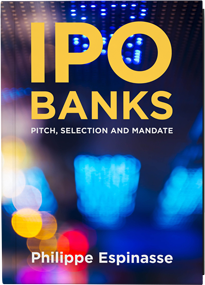 This book is mainly concerned with the early stage of the IPO process, mostly before the banks and other key participants actually come on board. 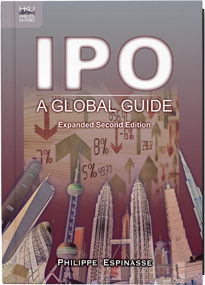 While I do touch on some of the IPO execution issues, these are dealt with in much greater detail in my previous book, IPO: A Global Guide, published in 2011. I have since given more than a hundred interviews and talked at many conferences. 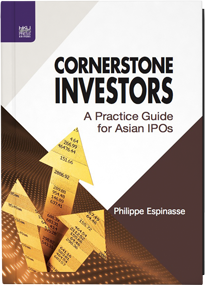 I have also lectured at Hong Kong University and various professional institutes, including the Hong Kong Securities and Investment Institute, for which I have jointly authored the study manual for the new IPO sponsor examinations in Hong Kong. I am very grateful for the positive feedback I have received. 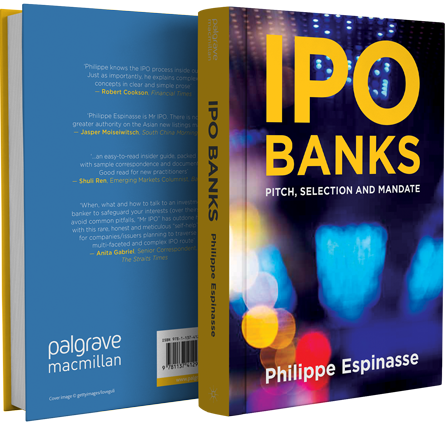 I thought it would therefore also be useful to unearth what happens – or rather should ideally happen – as banks originate IPO mandates, an area that few understand beyond the investment banking industry and which has hardly been explored and written on by other authors before. According to database provider Dealogic, global IPO volume stood at just above US$173 billion and 934 transactions in 2013. Among these, 38 IPOs representing more than US$1 billion each accounted for 37 per cent of the total, the highest activity for such ‘elephant’ deals since 2007 and an indication that primary equity volumes are on the up after the lean years that followed the recent sub-prime crisis. IPO revenue over that same period totaled US$5.7 billion for investment banks. However, in boom years such as 2006, 2007 or 2010, annual global IPO volumes reached some US$300 billion raised by issuers through, on average, about 1,500 transactions. At the time of writing, considerable, additional IPO volume had taken place in the fourth quarter of 2013 and investment bankers expected the volume of new stock market listings to continue to increase in 2014. Behind each potential IPO are probably a dozen or more houses actively competing to be mandated for a share of that fee pool. I have therefore sought to provide tips and ideas for issuers and their shareholders to make the most of that contest. As usual in the world of finance, circumstances change and new rules and regulations are enacted on an ongoing basis, so this book does not in any way whatsoever include investment, investment banking, corporate finance, advisory, legal, taxation, accounting, actuarial, regulatory financial or other advice of any kind in any jurisdiction. No responsibility or liability, with respect to any action, omission, recommendation or comment in relation to any matter or anything contained herein will be accepted. On a friendlier note, however, I am always keen to hear from you whether you are a prospective IPO candidate, an equity issuer, an equity capital markets (ECM) professional, an investment banker, a private equity practitioner, an investor, a journalist or a student in finance. I hope to have uncovered some of the mysteries of what goes on behind the scenes as RFPs are drafted and issued, and as investment bankers prepare for battle to win new business, a phenomenon that is sure to persist in developed markets and emerging and frontier markets alike, amid the hot pursuit of equity capital.